Our Exploration Packages are designed for adventure, variety and comfort, allowing guests to explore the natural wonders of the Galapagos islands in a new land-based way. We offer guided day adventures that cover the distinct wildlife and landscapes of the Galapagos National Park and Marine Reserve under three, four, five, six or seven-night programs. Our location on the central island of Santa Cruz allows easy access to some of the best National Park's visitor sites and beaches on our private yacht M/Y PIKAIA I and our fishing & snorkeling boat M/B Pikaia II. Our hotel-yacht day programs offer guests a spectacular, safe and comfortable way to experience the Galapagos Archipielago. Minimum stay at Pilaia Lodge is usually for 3 nights. For shorter stays and/or other special arrangements please contact our reservations department. Taxes and 10% service charge included. For reservations in October and November only or while M/Y Pikaia I is out due to maintenance. Rates listed above are after a 35% discount from our published rate. Windrose navigations are on a shared basis with other Windrose guests. Lunch and snacks are provided on board by Windrose. Snorkeling is available during the navigation. Windrose will provide all equipment. Windrose does not have private cabins for guests. Pikaia Lodge and Windrose do not accept changes to reservation dates. Pikaia Lodge will provide transport to and from the dock. Children below the age of 8 are not allowed. Itineraries are subject to the Windrose own yacht schedule set by the National Park Galapagos. Please note that these may differ from Pikaia Lodge´s itineraries. Private charters are subject to availability. Special conditions apply. All other terms and conditions apply as per Pikaia Lodge’s terms and conditions section. Check-in: 12 PM. Check-out: 10 AM. *All financial returns are subject to government taxes and handling fees. These charges may add up to 20%. Festive season: Spring break, Christmas and New year. A festive season surcharge of 10% is applicable for Spring Break, Christmas and New Year. All reservations have a "tentative" status until the reception of the required deposit payment. With the deposit payment, the reservation(s) will be changed to a “confirmed” status. Pikaia Lodge (Galapacific S.A.) does not accept changes to the reservation dates. Reservations and excursions are non-transferable. Pikaia lodge (Galapacific S.A.) does not accept name changes to confirmed bookings. In addition to our cancellation penalties, all financial returns are subject to government taxes and handling fees. These charges may add up to 20%. Credit card fees, bank transfer fees and other charges incurred in the process of transferring to us will be settled by the paying party. Pikaia Lodge (Galapacific S.A.) does not accept changes in the reservation dates. In case guest(s) change the reservation, we will consider it as a new reservation and it will be subject to all the applicable penalties. Cancellation Refunds are subject to transfer charges such as: credit card commission, exchange rate and bank transfer fee among others. We strongly advise our guests to take vacations cancellation insurance with their local insurance company. If a tour company does not send the total payment to our office or our bank account on the dates and conditions specified by our reservations and cancellation policy, Pikaia Lodge (Galapacific S.A.) is entitled to cancel the reservation, and will not be held responsible for the cancellation towards the guest. Pikaia Lodge (Galapacific S.A.) reserves the right to cancel a reservation prior to departure for any reason whatsoever, including logistical problems that may impede trip operations. The refund of all payments received shall release the Lodge from any further liability. If a trip is cancelled due to acts of God, war, labor, strikes, volcanic eruption, earthquake, flooding, tropical storms, etc., Pikaia Lodge (Galapacific S.A.) will promptly refund the portion of the trip cost not already advanced to suppliers and use its best efforts to recover and refund the balance as promptly as possible. However, Pikaia Lodge (Galapacific S.A.) does not guarantee recovery of any or all of the advanced payments made, and our use of best efforts to recover these payments will not include the institution and/or cost of any legal proceedings. Pikaia Lodge (Galapacific S.A.) will not be subject to refunds for proportions of the stay missed due to delayed or cancelled flights prior or during the journey to the lodge. Pikaia Lodge (Galapacific S.A.) is not responsible for expenses incurred by trip members in preparing for a cancelled trip (e.g., non-refundable advance purchase air tickets, visa fees, equipment, etc.) or any additional arrangements should the trip member have embarked prior to the scheduled departure date. Exploration packages include a specific itinerary. If the guest is interested in an optional additional activity it is highly recommended to plan such activities in advance. Additional activities are subject to availability. A festive season surcharge is applicable for Christmas and New Year. Children are welcome at Pikaia. However, we highly discourage bookings for children under 8 years old. A child can be accommodated on a roll out bed in the parents’ room if they are 16 years of age and under. A maximum of two adults and one child sharing per room is allowed. In the case that a child is preferred to be accommodated in a separate room, full adult rates will apply. Children under 15 years of age are not permitted to stay alone in their own room. Parents with two children under 12 years of age will be roomed as follows: one parent and one child per room. Children should be accompanied by an adult during all explorations and activities. Pikaia Lodge does not provide any stroller or car safety equipment for guests with children. Full rate is charged for children for all optional additional activities. One time per person payment of the Galapagos National Park Transit Card (USD $20.00 per person*) is to be paid in cash by the guest at the airport in Quito or Guayaquil before flying to the Galapagos (unless the tour company has expressly made other arrangements for payment). Payment of the Galapagos National Park Entrance Fee (USD $100.00 per adult / USD $50 per child*) is to be paid in cash by the guest upon arrival at the airport in the Galapagos, (unless the tour company has expressly made other arrangements for payment). All of Pikaia’s staff works very hard to make your stay and experience a memorable one. Prices quoted in packages do not include tipping and gratuities; therefore if you feel our services merit a token, we observe a centralized tipping policy. The crewmembers do not participate in the 10% service charge of the room rate. Tipping the ship’s crew is customary, but it should reflect your personal level of satisfaction. If you are happy with the service on board, feel free to leave a tip in an envelope and hand it to the captain or a crewmember. Tips are split evenly among the crewmembers. Hotel staff benefits from the 10% service charge of the room rate. If you are happy with your stay and service, feel free to leave a tip in an envelope and hand it to a member of the executive team. We contract our naturalist guides externally. If you are happy with their service and would like to tip them, please tip them directly. When booking a package, it’s highly advisable to reserve your optional additional activities either at the same time or as soon as possible thereafter. Activities in the Galapagos National Park or Galapagos Marine Reserve, such as day boat trips, dive trips and other excursions can fill up well in advance of your arrival. Pikaia Lodge (Galapacific S.A.) recognizes that its guests may wish to take part in these optional tours and excursions while staying at Pikaia Lodge (There are local companies that offer these services in the Galapagos Islands). Pikaia Lodge (Galapacific S.A.) provides solely an informational service to its guests, so that its guests may themselves choose their own company and services suited to the wishes and skill level of the guest. Any guest at Pikaia Lodge (Galapacific S.A.), in arranging any of these above mentioned excursions in the Galapagos Islands, fully acknowledges that they are doing so freely and of their chosen company. Said guests agree to understand and assume all risks inherent in these activities in the Galapagos Islands and agree to release Pikaia Lodge (Galapacific S.A.), its employees and agents from any liability whatsoever for any mishap while in the Galapagos, no matter the circumstances or cause thereof. Exploration packages include a specific itinerary. If the guest is interested in an optional additional activity it is highly recommended to plan such activities in advance. Pikaia Lodge (Galapacific S.A.) will not be subject to refunds for services provided by their chosen company. * Additional activities are subject to availability. Pikaia Lodge (Galapacific S.A.) accepts the following credit cards: Visa, MasterCard, Diners Club and American Express. Full name of each member of the party under which you made your reservation. 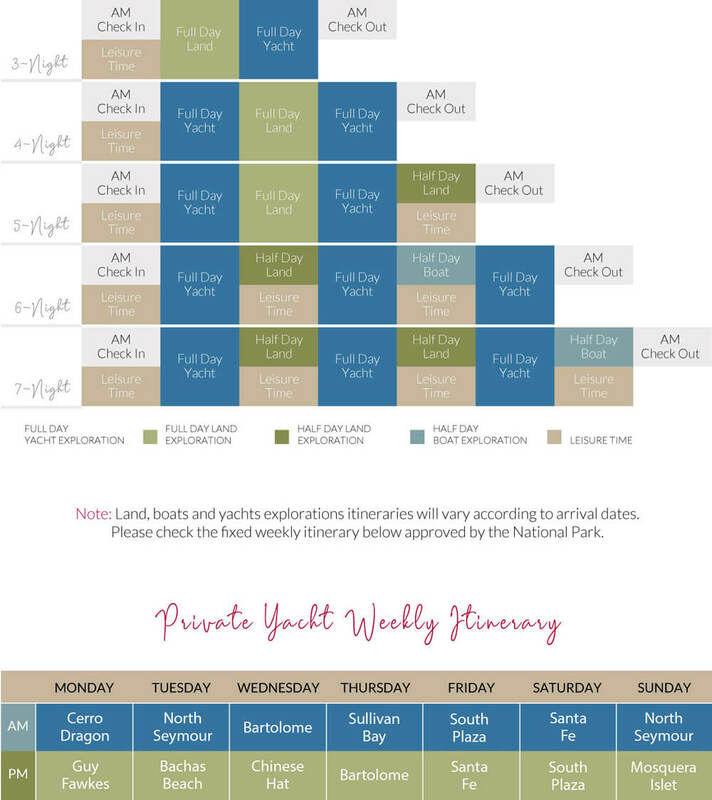 Dates of your arrival at Pikaia Lodge (Galapacific S.A.). Please indicate to us the date and amount of the wire transfer. Fees charged by your bank for wiring a money transfer must be paid to your bank and should not be deducted from your invoice. Upon confirmation of your payment/deposit Pikaia Lodge (Galapacific S. A.) will send you a confirmation e-mail with the reservations we are holding for you, the same applies to your reservations of optional additional activities and pre-trip information designed to prepare you for your visit to Ecuador and the Galapagos Islands, including information on visas, clothing, equipment and other relevant information. Snorkeling and Dietary Restriction forms must be completed and signed by all guests and must be returned to Pikaia Lodge to complete the reservation.